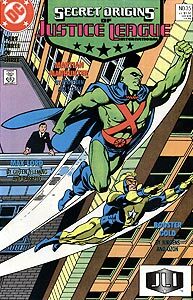 Cover Description: Martian Manhunter and Booster Gold fly into the sky as Maxwell Lord watches from a nearby rooftop. This cover completes a triptych of the Justice League International begun with Secret Origins, Vol. 2, #33 and #34. Brief Synopsis: Booster reveals his own history to Blue Beetle II. Issue Notes: The frame story for the retelling of the origin of Booster Gold involves Blue Beetle and Booster Gold trying to market the personality of the Justice League International. 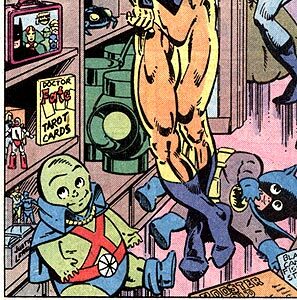 PRODUCT PLACEMENT: Booster's room at the New York JLI Embassy is full of his latest marketing scheme: Justice League merchandising. The room is full of prototype items, including Booster Gold action figures (bottom left), Booster Gold board game (bottom right), and other Justice League items such as a lunch box and puzzle, both including Booster Gold. PRODUCT PLACEMENT: Booster appears on the cover of Time magazine with the headline "The New Breed of Hero." 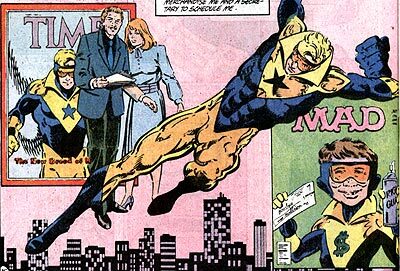 He is also parodied on the cover of Mad magazine, where Mad mascot Alfred E. Newman dresses in as Booster Gold with a dollar sign replacing the star on his chest. Martian Manhunter's denies Booster the opportunity to cash-in on the League's image, calling Booster's plan "Hucksterism." Booster doesn't give in without a fight. PRODUCT PLACEMENT: While searching for the Black Canary Designer Lingerie among Booster's planned products, Beetle finds a Mister Miracle Padlock, Captain Atom Silver Polish, Oberon Elevator Shoes, and Green Lantern "D" Cell Batteries. Boosterrific Review: Finally character-creator Dan Jurgens provides the complete and detailed origin of the downfall of Michael Jon Carter. This origin only significantly differs from previous tellings in the inclusion of the "sick mother" as the motivation for the Booster Gold's gambling troubles. This may be an attempt to somewhat soften Booster Gold's rough edges for his inclusion in the Justice League. Rather than bolster Booster's character, it only weakens the story of his origin with the inclusion of such a tired cliche. The story is not aided by Tom Dzon's inks, which make Dan Jurgens' pencils almost unrecognizable. While the origin story is a pedestrian reassembling of previous tales, the brief frame story is highly amusing and includes a number of sight gags and licensed products in the best tradition of Booster Gold. The book is also worth a look for the enlightening "Secrets Behind the Origins" column about Booster Gold by editor Mark Waid. Worth Its Weight In Gold. Great recap on Booster for all those who came in late-added with a little bit of Blue and Gold fun. Show Terms and InstructionsAll unsolicited ratings, reviews, and assocatiated information are supplied to Boosterrific.com in a voluntary manner and once submitted become the intellectual property of Boosterrific.com. Boosterrfic.com will not sell or distribute any personal information provided for reviews. Personal information not volunteered in reviews is gathered purely for record keeping, maintenance, and necessary correspondance. Email addresses provided will be maintained in confidence. (Like you, Boosterrific.com really, really hates spam.) All reviews are intended for a family audience (keep it clean!) and are subject to moderation or removal at the discretion of Boosterrific.com administration. Submission of information to Boosterrific.com indicates an agreement to these terms. Boosterrific.com thanks you in advance for your cooperation.